Of course, trains can’t fly over oceans like airplanes. But that doesn’t mean trains can’t run as fast as planes. Fortunately, some trains in this modern world are as fast as planes. Followings is the list of ten fastest trains in the world. THSR 700T is a series of Taiwanese high-speed multiple unit trains. This service started on 5th January 2007 between Taipei City and Kaohsiung. At the top speed of 186.4 mph, THSR 700T could shorten the journey time between these cities from four and a half hours to just 90 minutes. A 700T train has 12 car sets in total. It features a multi-engine system and 9 out of 12 cars provides power for the train. What it offers are the speed and space. 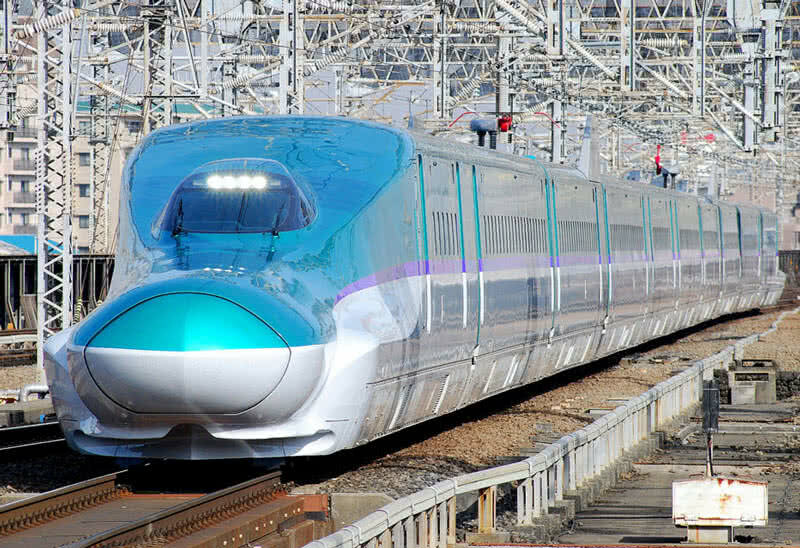 700T trains are built in Japan by the consortium of three major companies – Kawasaki heavy industries, Nippon Sharyo, and Hitachi. The powerful motors in 700T provide an acceleration from 0-186.4 mph in just 15 minutes. The adoption of European safety requirements also promises enhanced safety features in 700T like bi-directional operation, instability detection system, fire and smoke detectors and station stopping control. 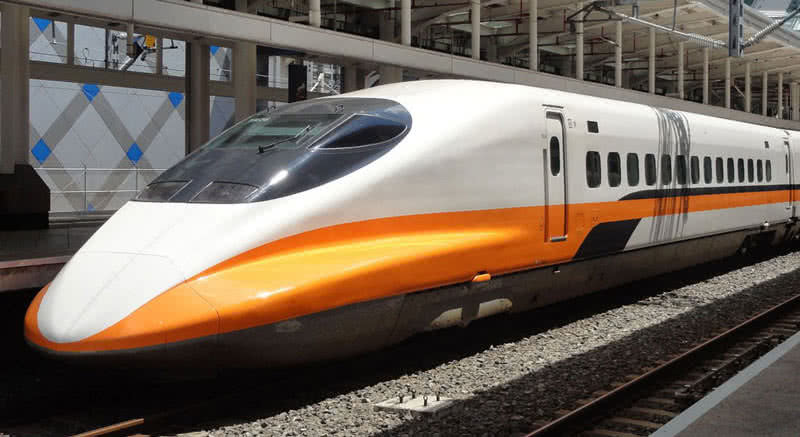 There are thirty 700T trains are operated under Taiwan High-Speed Rail currently each 700T train has a single business class and 11 standard class cars. The business class cabin in 700T can seat 66 passengers, and standard class offers 923 seats. The cars of THSR 700T are soundproof and provide real-time travel information. ETR 500 Frecciarossa is the fastest train service in Italy, operated by Trenitalia company. The Frecciarossa trains have a maximum speed of 186.4 mph. 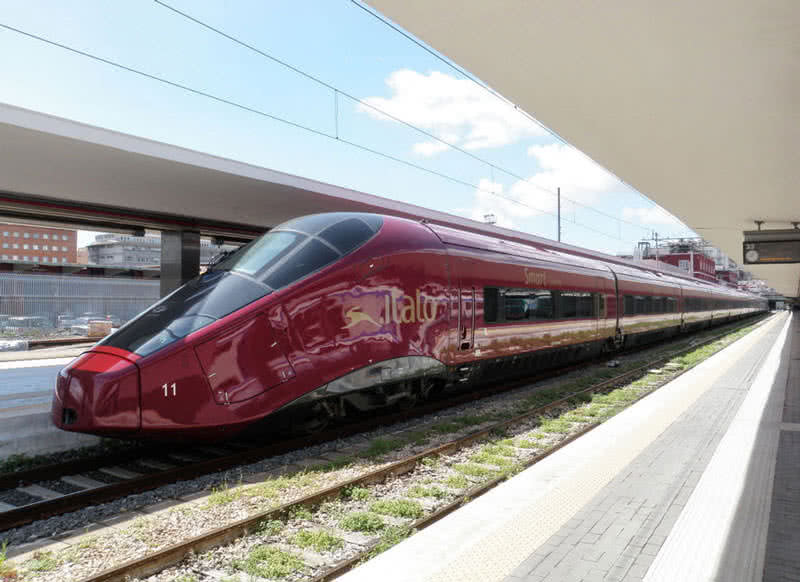 This service runs between Milan-Rome-Naples route and offers 72 connections daily. Today there are 28 non-stop Frecciarossa trains between Milan and Rome. At the top speed of 186.4 mph, a Frecciarossa will reach Rome from Milan in just 2 hours and 40 minutes. 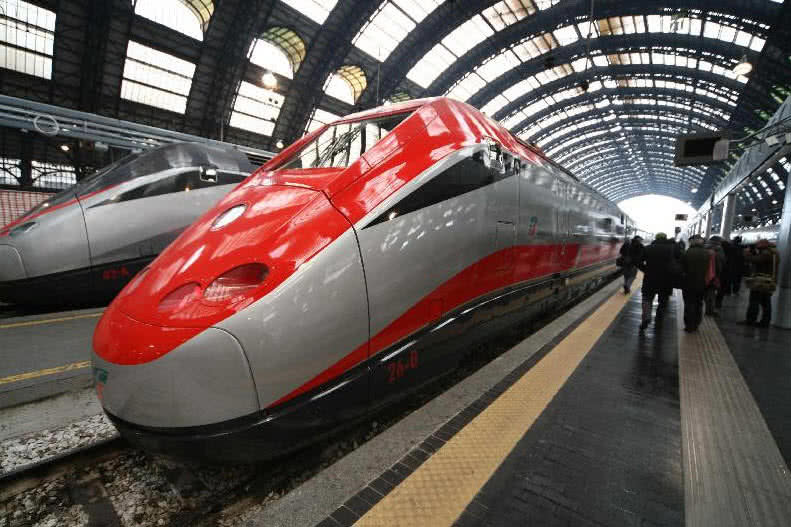 Frecciarossa train is a modernized version of ETR 500 Italian high-speed train. Frecciarossa trains built by a consortium of AnsaldoBreda, Bombardier, and Alstom manufacturing companies. A Frecciarossa train has four main cabins – standard class, premium class, business class, and executive class. The cars of Frecciarossa trains are soundproof and offer free Wi-Fi. TGV duplex is the fastest train service in France. This powerful train can touch a maximum speed of 198.8 mph. 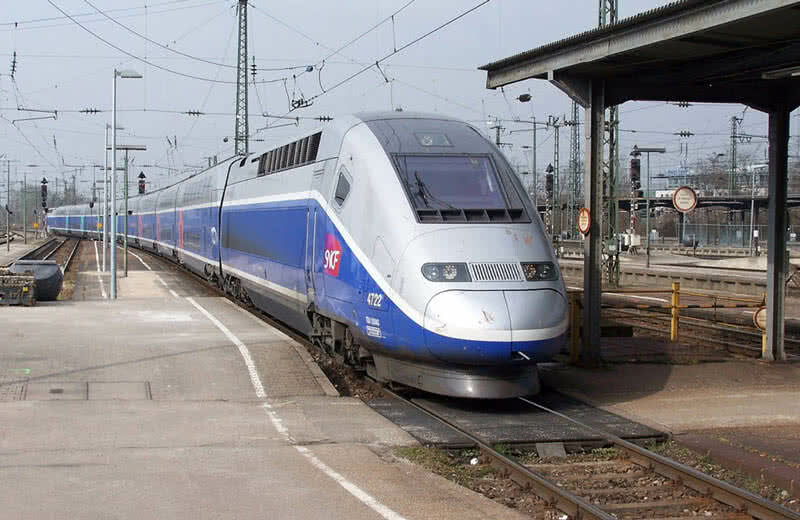 The SNCF railway company operates this high-speed train service. TGV duplex started the service in December 2011. 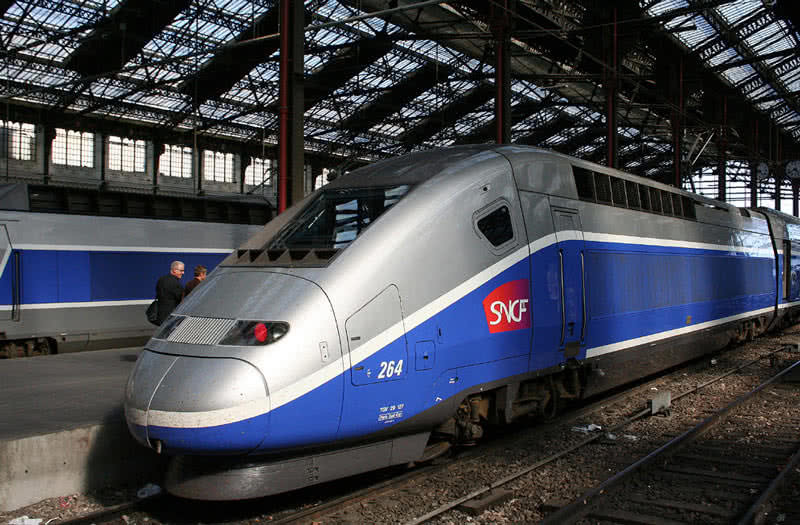 It is a double-deck, high-speed train that connects all the main cities in France. It is one of the most comfortable European trains that has a seating capacity of 508. Alstom manufacturing company builds TGV duplex trains. They used high-quality aluminum for the construction of TGV duplex to reduce weight. TGV duplex has an eco-friendly design and a recyclability rate of 90%. The stiff passenger compartments in the train also ensure the safety in case of the collision. The TGV duplex train offers three main classes for passengers – standard class, first class, and TGV Pro. The standard class features comfortable seats, snack vending machines, and a bar buffet. In the first class, you will get more comfortable reclining seats, individual reading lights, and sockets for your electrical devices. The TGV Pro class offers extra comfortable and spacious seats, a welcome drink, free Wi-Fi, newspapers, and magazines. Euroduplex trains are the third series of TGV duplex high-speed trains. The French railway company SNCF operates the Euroduplex train service. This service connects French, Swiss, German and Luxembourg rail network. This multi-system, double deck rains can travel at a maximum speed of 198.8 mph. Euroduplex trains started the service in December 2011. This train can transport 1020 passengers at a time. The Alstom railway company designs the Euroduplex trains. Unlike the previous two generations, the Euroduplex trains are less in weight and have much-improved aerodynamics. It ensures low power consumption. Euroduplex trains also have real-time travel information screen near the door and inside the car set. E5 series Shinkansen Hayabusa is the fastest high-speed train service in Japan today. This train service started on 5th March 2011 and operated by the East Japan railway company. The e5 series train operates between Tokyo and Aomori. At the top speed of 198.8 mph, E5 series Shinkansen would reach Shin-Aomori station from Tokyo (distance – 444.28 mi) in just 2 hours and 56 minutes. The front car of the E5 series train has a 15-meter long nose. This design helps to minimize the sound and vibration while the train goes through the tunnels. The design of Hayabusa train is based on Fastech 360S high-speed train developed by the East Japan Railway company. The E5 series Shinkansen has ten cars and a seating capacity of 731. Each E5 series Shinkansen has three main classes – standard, green and gran class. The standard class offers 658 seats, the green class offers 55 seats, and gran class offers 18 seats. The gran class is the main attraction of the Hayabusa train. This premium class offers high-end luxury facilities for you! In gran class, you can see 18 extra comfortable power-reclining seats with the leather coating. All passengers will get amenities such as eye mask, slippers, and blankets. The staff will also serve soft drinks and food for you. Spain’s Talgo 350 high-speed train operated by the state-run railway company. This high-speed train can achieve a maximum speed of 217.4 mph. The Talgo 350 runs between Madrid and Barcelona. This train has two driving cars and 12 passenger cars. It is also known as ‘Pato’ in Spain, named after its duck beak like the nose of the front car. This distinctive design of Talgo 350 is optimized to handle pressure waves. The seating facilities in Talgo 350 trains divided into four classes – Club class, First class, Bistro class, and Coach class. All class in Talgo 350 features comfortable reclining seats with footrests. The passengers also have access to video, audio devices at each seat. There are also real-time information panels on both inside and outside of car sets. 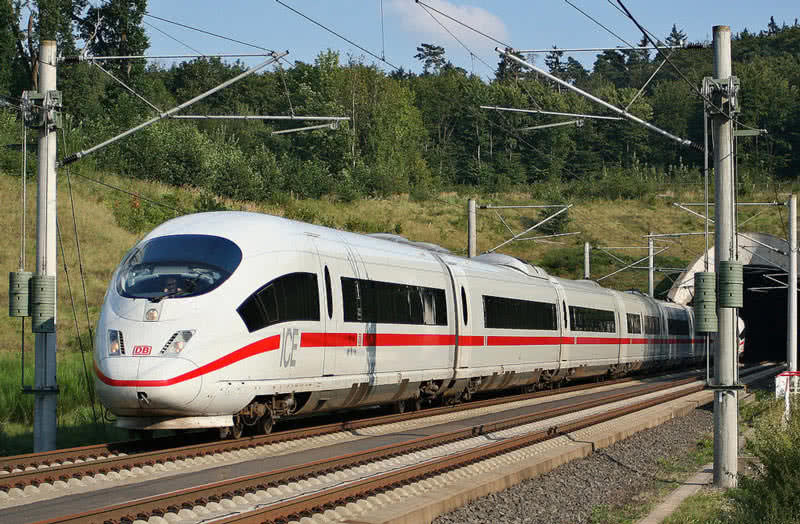 Velaro E is the Spanish version of Velaro E high-speed trains developed by German engineering company Siemens. In Spain, Velaro trains named as AVS 103. The Velaro E operates between Barcelona and Madrid. Velaro E runs at a maximum speed of 217.4 mph. Velaro E trains can take passengers from Barcelona to Madrid in just 2 hours and 30 minutes. During trials, the Velaro E achieved a top speed of 250.84 mph. The Spanish National Railways ordered the high-speed Velaro E trains in 2001. They began this high-speed train service in June 2007. Velaro E has eight passenger cars and a seating capacity of 404. AVG Italo is the fastest running train in Europe. 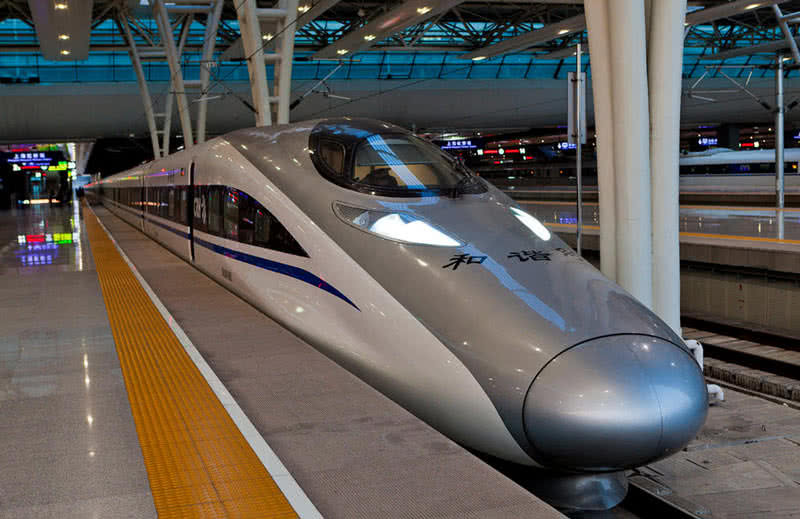 This high-speed train has a maximum operational speed of 223.6 mph. But during initial test, in 2007, AVG train set a record speed of 356.6 mph. French manufacturing company Alstom built this multiple unit train. In 2008, the Italian company Nuovo Trasporto Viaggiatori (NTV) ordered 25 AVG trains from Alstom for € 650 million. The AVG Italo started the service in April 2007. It operates between Rome and Naples. The passengers of AVG Italo trains can travel between these cities (distance – 140 mi) in just an hour. AVG Italo has great Eco-friendly structure, 98% of its parts are recyclable. AVG Italo has 11 car sets. The seats divided into three classes – Club, Prima, and Smart. All three classes of AVG Italo offers adjustable leather seats, live television, and free Wi-Fi. China railways Harmony CRH 380A is the second fastest operating train service in the world. In commercial service, this electric, multiple unit trains can achieve a maximum speed of 236.12 mph. But it sets a record speed of 258.58 mph during initial tests. In October 2010, the China railways put CRH 380A trains into regular service between Shangai-Nanjing route. CRH 380A high-speed trains manufactured by the CSR Qingdao Sifang Locomotive and Rolling Stock company. The CRH 380A has low weight Aluminium alloy body and also a fish-head like the front car. This unusual design of the train could reduce aerodynamic pressure on running. The bogies of CRH 380A are also entirely vibration free. The CRH 380A trains can carry 494 passengers at a time. Each passenger will get facilities like the reading lamp, power port, and an electronic display. There is also a VIP sightseeing section near the driver’s cabin. It shows a view of the running train. One whole car unit of CRH 380A dedicated for serving food and drinks for passengers. Shanghai Maglev is the fastest train in the world with a maximum operating speed of 267.8 mph. This service operates by Shanghai Maglev Transportation Development Co. Shanghai Maglev runs at Shanghai’s high-speed magnetic levitation line. Maglev is an abbreviation of magnetic levitation – suspension or floating of an object by the magnetic field. Unlike regular train tracks, Shanghai Maglev has no wheel, and it floats on magnetic field existing between the train and track. This electromagnetic pull offers by the powerful magnates let the train to fly over the track as there is no contact between train and track. Shanghai maglev could reach its top speed of 267.8 mph from 0 mph in just 4 minutes. The Shanghai’s 18.95-mile long maglev line is the only commercially operated maglev in the world. 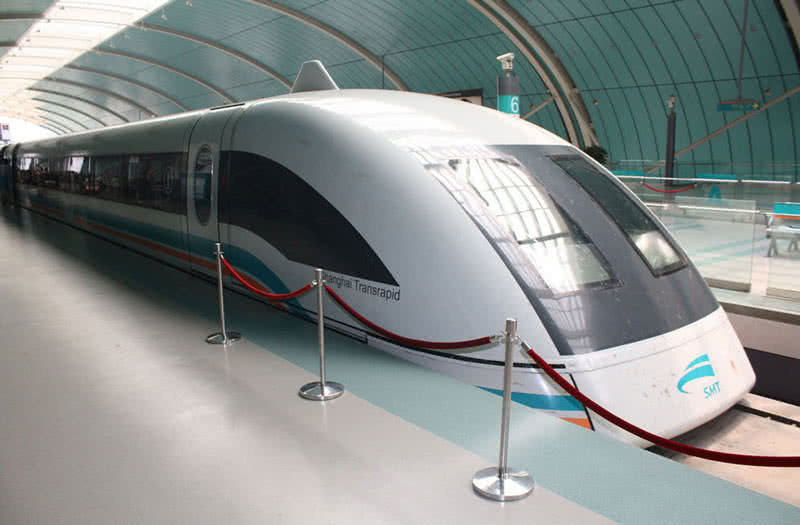 Siemens and ThyssenKrupp companies built the Shanghai Maglev. The public service of the Shanghai maglev started on 1st January 2004. It operates between Long Yang Road and Pudong international airport. The Shanghai maglev only takes 7 minutes and 20 seconds to complete the whole journey. The total passenger capacity of the Shanghai maglev train is 574. Also, the train operates in every 15 minutes. It cost US$8 for one ticket and US$16 for a VIP ticket to travel in Shanghai maglev.